Lock in a great price for Hospedaje Germania – rated 8.6 by recent guests! Great location, clean, affordable. Nice warm showers with pressure. Clean, hot water, drinking water, coffee in the morning. Big room with balcony, kitchen sink and fridge. All a big plus. Host very friendly and helpful. Colorful, clean, attractive decorations. Great location. Quiet. Friendly owner and staff. Took us on a jaunt to the highlands for a very reasonable price. Location is great for hiking out to bahia tortugas or laguna Dr's ninfas. Super close to main dock as well. Good location, spacious rooms, access to bottled water (though an additional water station closer to our rooms for 24/7 access would have been even better). Big bed. Very helpful staff. Air conditioning. Plenty of space. Fridge. Kitchen sink so we could do some washing. The location is brilliant. My daughter left her fanny pack containing some specialized and very expensive compounded medicine on Isabela island we were very worried about retrieving it but we told the owner of Germania, Raphael, about our problem and he grabbed the phone chatted with the hotel we had stayed at on Isabela. The next morning Raphael delivered the fanny pack to our room. We are so grateful for the his help. Great staff - very friendly and knowledgable about the area. Good location not too far from port. Our room at the back was quiet. Fridge in room. One of our best sellers in Puerto Ayora! Offering a restaurant, Hospedaje Germania is located in Puerto Ayora, 40 minutes’ drive from Canal Itabaca. Free Wi-Fi access is available. 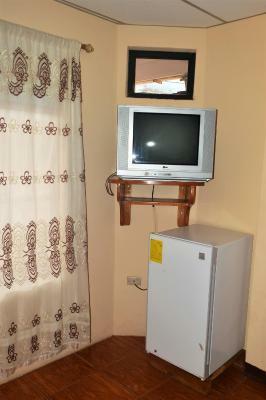 The rooms offer wooden furniture, TV and air conditioning. Private bathrooms also come with a hot shower. 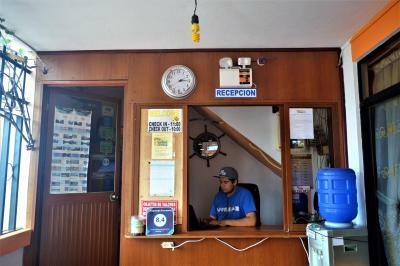 At Hospedaje Germania you will find a 24-hour front desk. Other facilities offered include a tour desk and luggage storage. Guests can find restaurants and supermarkets within 350 feet. This property is just 150 feet from Las Ninfas Lake and 0.6 mi from Punta Estrada Beach. 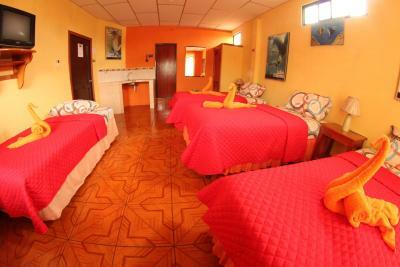 This is our guests' favorite part of Puerto Ayora, according to independent reviews. 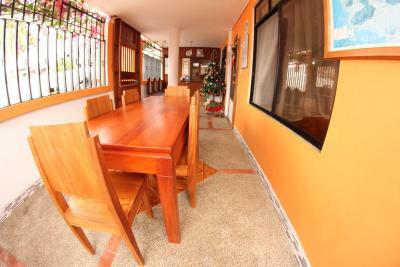 This property is also rated for the best value in Puerto Ayora! Guests are getting more for their money when compared to other properties in this city. 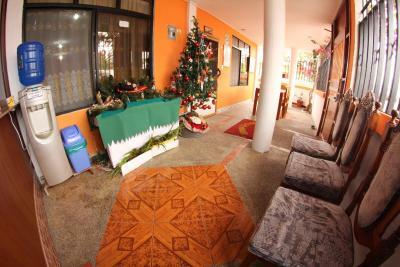 뀐 Located in the top-rated area in Puerto Ayora, this property has an excellent location score of 9.1! When would you like to stay at Hospedaje Germania? 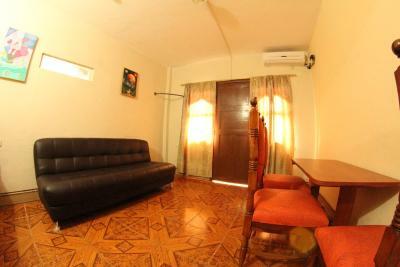 This room offers a double bed, wooden furniture, TV and air conditioning. The private bathroom also comes with a hot shower. 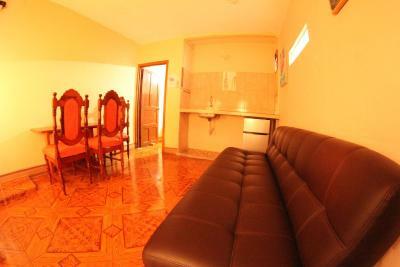 This room offers wooden furniture, mini-bar,TV and air conditioning. The private bathroom also comes with a hot shower. 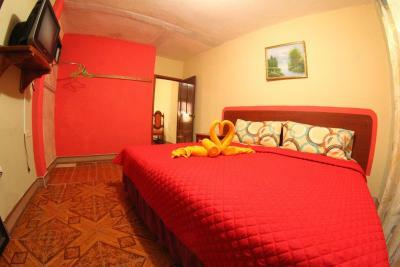 This room offers wooden furniture, mini-bar, TV and air conditioning. The private bathroom also comes with a hot shower. House Rules Hospedaje Germania takes special requests – add in the next step! One child from 4 to 10 years is charged 50 % of the room stay per night and person when using existing beds. One older child or adult is charged 100 % of the room stay per night and person when using existing beds. Hospedaje Germania accepts these cards and reserves the right to temporarily hold an amount prior to arrival. Please inform Hospedaje Germania of your expected arrival time in advance. You can use the Special Requests box when booking, or contact the property directly using the contact details in your confirmation. The shower. We had a lot of trouble trying to get it to work at a consistent temperature. Weird set up with security gate if there is more than one person in the room, you have to get the person at desk to let you into gate and room...only one key per room. Person wasn’t always at the reception to let you in. They also did not tell our friends that they had to vacate their room for another reservation until the hour they had to be out of the room. it was a scramble. Would have appreciated a bit of notice, since they knew in advance. Wifi was very weak in the room. The screens let in the biting insects. No curtain or blind at the bathroom window. No storage space in room so bags and clothes had to be left on the floor. Wifi never worked even though we reported it (every other place we stayed in Galapagos had working wifi even if very slow). We stayed 2 days and then found somewhere else. Comfortable beds, great showers & even better aircon! The origami towels were great. The room was in fairness, really large, with an extra lounge area with a sofa and single bed. There is a locking gate so it's secure. The man was very friendly and gave us advice on where to dive. The location was really close to the street-food street, which is excellent. Really cute hostel. The man at check in was really nice and welcoming. The room was great and really clean plus it had a fridge. Location is excellent, really close to the main area but off on a little side street. wi-fi is slower than slow. but that seems to be how all of santa cruz island is. great location, only a minute walk to town. owner is really friendly and helpful!! clean rooms, hot showers, fridge in the room. 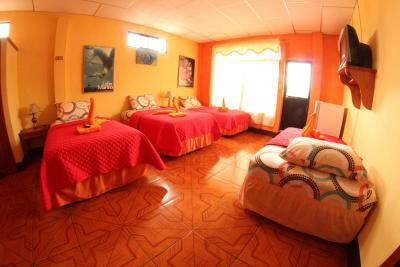 a great place to stay for exploring puerto ayora. Nothing really. The towels, though clean, looked a bit worn down with stains. I would change those..
Big rooms, we had the one sharing a balcony with a seat with two other rooms. The location is a great quiet street one block away from the foodstalls. Great airco. No noise and keeps a nice temperature. Which was necessary as it was unbelievably hot. Shower was spacious and good water. Galapagos prices are generally high , considering we found this a very spacious and good room and stayed our remaining week here. Also we had a big fridge, also very welcome.